THE FIRST ANTI-AGEING TREATMENT ACTIVATED BY YOUR SMARTPHONE! Can I tone my facial muscles and get a lifting effect in just 10 minutes whilst comfortably relaxing on my sofa? Now you can, with Play Skin®! This revolutionary do-it-yourself beauty product manages to combine the effectiveness of a Hydrogel beauty mask with the stimulating and relaxing effect of the micro-currents of your smartphone. In 10 minutes, your skin will be visibly oxygenated and regenerated. Play Skin®is an innovative do-it-yourself beauty treatment which is both futuristic and simple: it is an “intelligent” facial mask which works when connected to your smartphone. 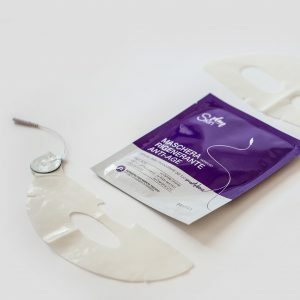 Each pack contains five single-use Hydrogel masks to apply directly to the face, and a pair of electrodes to connect to the mask and to your mobile phone using the jack. After connecting the mask, simply open the App you downloaded which will display the 10-minute timer. At the end of the treatment, all you need to do is apply Play Skin®‘s glycolic and teprenone-based rejuvenating cream. The result will be a more luminous, toned and regenerated skin. Play Skin is available at a special price for a limited period of time!